Dante was a family man with a wife and young daughter, and also a top assassin working for an international crime syndicate. For two decades he worked hard to keep these two lives separate and was then ready to retire. Manipulated into thinking he could quit with the syndicate's blessing, Dante was betrayed and accidentally killed a young Asian boy while fi ghting to save himself. This act changes him forever as he is supernaturally cursed and wakes up inexplicably covered with tattoos. 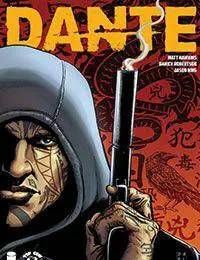 Dante tries to uncover the source of this supernatural curse while looking for his family that has now disappeared.